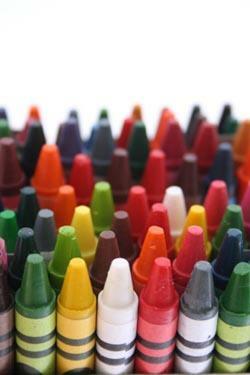 Old crayons can be recycled into unique handmade candles. Candle making and Crayola crayons are a surprisingly wonderful combination. Instead of simply tossing out your child's broken bits of crayons, recycle them into beautiful and unique handmade candles. Most of the items you need to complete this frugal craft project can already be found around your home. Combining the craft of candle making and Crayola crayons offers endless opportunities for creative expression while allowing you to develop the confidence you need to pursue more advanced candle making projects. Cut a length of string approximately six inches long to use as a wick. If you wish to add extra stability to your candle wick, you may want to try braiding together three lengths of string. Melt your paraffin wax over medium heat in old coffee can placed in a pan of water. Paraffin is easily combustible, so it should never be heated directly above the burner. One pound of paraffin wax is enough to create one medium sized candle. After the water starts to boil, it should take between 10 and 15 minutes for the paraffin to melt completely. After you've removed any leftover paper packaging, add the bits of broken crayons to the melted paraffin wax until the desired color is achieved. If you add the crayons to the pot first, the color will make it hard to see if the paraffin has melted properly. Add a two to four teaspoons of vanilla extract per pound of paraffin wax if you wish to make a scented candle. Use your tongs to dip the bottom of your string into the melted paraffin. Tie the top of the string around the pencil and put the pencil across the top of the container to hold the wick in place. Slowly pour the paraffin and crayon mixture into your candle container. Use the potholders to protect your hands and the safety goggles to guard against splashing wax. Wait 30 minutes to one hour to make sure your wax has time to cool. When your candle is set, snip off the wick about half an inch above the wax. If you used a cardboard milk container to make your candle, carefully peel back the cardboard to reveal your finished creation. The combination of candle making and Crayola crayons can be a great way to introduce children to the joy of creating special handmade gifts for friends and family members. However, remember that working with hot wax can be very dangerous. Adult supervision is required for kids who wish to complete this project.